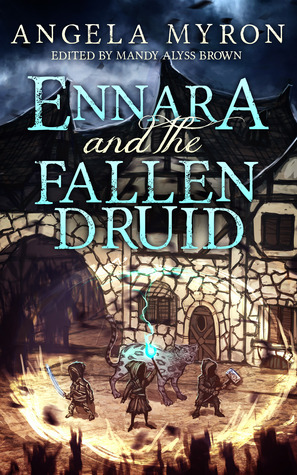 Today, I'm going to review one of the books I've had the pleasure to read: Ennara and the Fallen Druid (book one). My rating system, for those who are unfamiliar to it, is based off of 5 areas, each worth 5 points, totaling twenty-five points. The areas are: Writing Style, Plot, Characters, Conflict, Wrap Up. BUT, there's a slight change in plans for this one. Instead of the 25 point system, we're just going to talk about it. "When a mysterious curse threatens to transform everyone into shadowy demons, a magical eleven year-old girl must travel to a sunken city ruin—fighting pirates, monsters, and an undead sorcerer along the way—to find a weapon that can save her world." Okay. So, moving upward and onward, let's begin talking about this book. First: I wasn't given an age range (which is something I will be asking from now on), but given the content matter I did think it would be for an older audience. There is dark magic involved, and even the BBC show Merlin, which has dark magic in it, waited until its audience was older before introducing true dark magic. But, alas, this book was what I believe intended for 8-12 years old. Which is not bad at all! I just wished I would have known that before hand. Next: The content was difficult to get into. If I was the intended age range, I believe I would have enjoyed the book a lot! It reminded me of Judy Blume, only based in a Medieval setting and not having to do with small, annoying younger siblings. But the writing style had a lot of resemblance to Mrs. Blume's. The only thing I would have liked to see was the cliches be-gone. This seems to be a common problem among new writers--Dessen's first books had a ton of cliches, and I do firmly believe this author has great potential. A few more years and she'll be right on track! I were younger, I believe it would have been easy for me to get involved in. But because of my age--and how little I interact with young people--I don't think I enjoyed it as much as I could have. It has fantastic potential for the younger audiences, and I hope younger people do read it. It deserves a lot more than a silly teenager's review, for sureness. I 100% support this new author and I hope you all try her out, too. If you baby sit, read this to your youngsters! It'll be a fresh, new, entertaining read that your family will enjoy. P.S. This author is on Goodreads! Go stalk her!